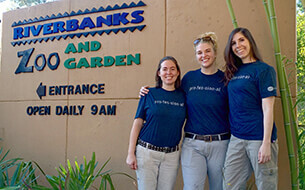 San Diego Zoo Global Academy Helps Riverbanks Solve the "Training Challenge"
Riverbanks Zoo and Garden, Columbia, S.C. Ensuring that the staff and volunteers of AZA-accredited zoos and aquariums have regular access to appropriate and timely professional education and training is critical. 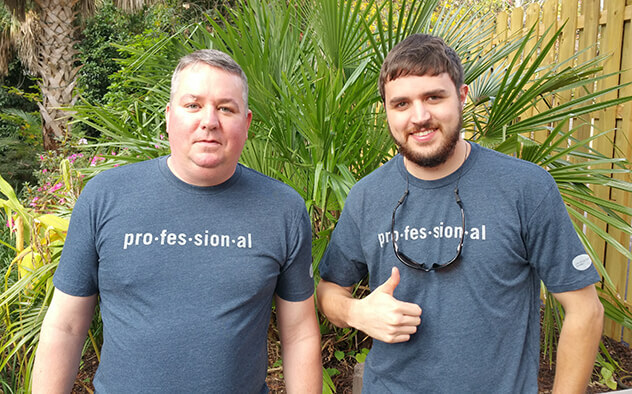 Indeed, AZA accreditation standards define and reinforce the need for contemporary zoos and aquariums to provide professional training opportunities for their staff and volunteers, across all major areas of operation. However, the development and revision of internal training curriculum, the scheduling of new and existing staff to complete training opportunities, and the documentation of completed assignments presents a significant challenge, particularly for smaller institutions. 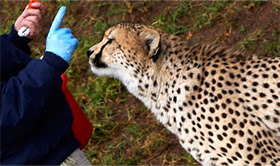 The animal division at Riverbanks Zoo and Garden has historically relied on a tiered system of a division-level training checklist for all new employees, coupled with departmental checklists that are specific to the areas where employees are ultimately assigned (such as mammals, birds, herps, aquarium, hospital, or commissary). Over the years, division-level training has evolved from a series of labor-intensive and difficult-to-schedule sit-down lectures to computer network/extranet-based policies and procedures that were assigned to staff for review, and then signed off on by a designated mentor (typically the department head). While this approach has proven to be much less labor-intensive than conducting lectures, it still requires a huge time commitment from the management team to develop and revise curriculum, serve as mentors and, importantly, track and document the training completed by each employee. The Riverbanks Zoo and Garden team are wearing their new Academy T-shirts. When I first heard of the San Diego Zoo Global Academy, it was immediately clear that the Academy had the potential to address many of our historical challenges with training and documentation. I contacted San Diego Zoo Global's Jon Prange, and Riverbanks became one of the Academy's early adopters. As the Academy site content grew in diversity and scope, it brought into clearer focus the potential that it held for our institution. In 2014, Riverbanks joined the Academy and included the Do It Yourself (DIY) courses option for our membership. The DIY courses have subsequently played a central role in an internal initiative to thoroughly review, upgrade, and consolidate Riverbanks' emergency policies and procedures. Prior to joining the Academy, a committee of Riverbanks employees—including senior managers, supervisors and members of the Safety Committee—convened to develop a plan for creating a comprehensive emergency procedures manual for the Zoo. Committee members gathered all relevant existing policies and procedures from the Riverbanks network/extranet and identified several additional potential emergencies for which we had no written policy. These new policies were subsequently drafted, vetted and approved, and, combined with existing policies, made up the new Riverbanks Emergency Procedures Manual. The finished manual consisted of 16 individual policies and procedures designed to guide the actions of Riverbanks staff and employees, in the event of those emergencies that are most likely to impact our institution. These Riverbanks Zoo and Garden gorilla/small mammal keepers are among Riverbanks' Most Active Learners. The Academy DIY courses provided Riverbanks with a platform to ensure that all new and existing staff and volunteers were adequately trained in each of these emergency polices and procedures. All 16 emergency policies and procedures were converted to a PowerPoint format and posted on the DIY course site, along with associated quizzes for each course that were designed to measure the employees' mastery of each topic. The first six DIY courses were assigned to all employees within the animal division, and approximately six weeks was allotted for everyone to complete the courses in order to accommodate staff work schedules. Once everyone had completed and passed the course quizzes, five additional courses were assigned. To date, a total of 482 individual DIY courses and quizzes have been completed and passed. I might add that this information (the number of courses completed) was easy for me to retrieve and cite here, because of the Academy's excellent documentation and reporting function! Electives—to be completed at the employee's leisure, with the approval of the relevant department head. Importantly, Riverbanks recently hired its first-ever training manager, who is hard at work developing curriculum for other divisions. Needless to say, there has been quite a bit of excitement expressed about the wealth of training opportunities that the Academy provides. I recommend the Academy to any institution that is looking for a flexible, cost-effective, and efficient method to provide professional training for its staff and volunteers, in all areas. Academy courses are presented by subject experts who are well known and respected in the field, and the courses allow each user the flexibility to complete the course as time permits. The Academy has provided Riverbanks with a valuable tool for addressing our "training challenge"—and we have only just begun. I would be remiss if I failed to mention the excellent technical support and general hand-holding provided by Chris Glenn and Mike Maether at CypherWorx, and San Diego Zoo Global's Jon Prange. Both have been extremely helpful as Riverbanks works to incorporate the Academy into our institution-wide training efforts. 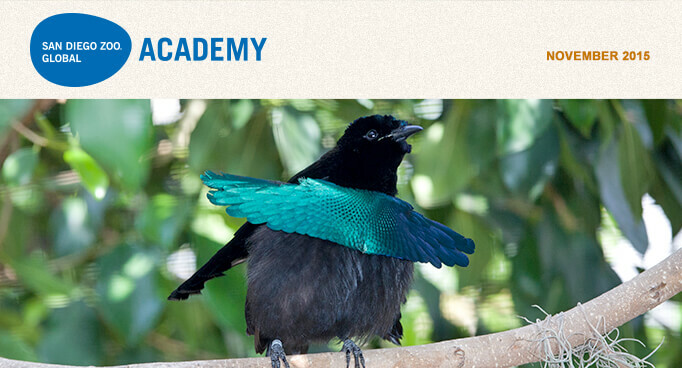 Interpreters, guides, docents, and keepers can dive into the fascinating world of birds, as the San Diego Zoo Global Academy presents Birds—the newest module in the Animals Species series. 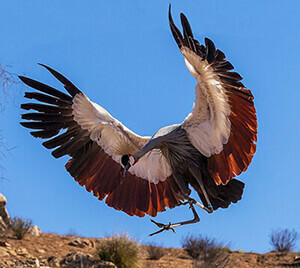 The module explores the natural history and conservation of birds. Remarkable images show a wide variety of bird species in ways you've never seen before, and video provides insights into their behavior. Interactivity throughout the module engages participants in the learning process, and questions at the end of each section ensure that they have mastered fundamental concepts before they move on. The Birds module takes about two hours to complete, although participants progress at their own pace and may repeat the entire course or sections of the course as many times as they like. The module can easily be integrated into your current training program. Providing online modules that team members can complete anywhere and at any time overcomes one of the major challenges of training: getting all participants together in one place at one time. At the San Diego Zoo and Safari Park, participants complete online modules on their own before attending group training programs. They are able to master key vocabulary and concepts, giving them a solid foundation that allows them—and their trainers—to make the most of in-class and on-site training. These modules are an awesome resource for interpreters, but they offer insights to veteran animal keepers too, providing a glimpse of natural history that helps keepers address husbandry concerns. This module addresses common questions and provides an up-close exploration of what birds are all about. Whether you've worked with these animals for years or you're a brand-new interpreter or docent, the module will equip you with a better understanding of these amazing animals. The Birds module joins Elephants, Cats, Orangutans, Great Apes, Lions, Cheetahs, Polar Bears, Giant Pandas, Tigers, and Gorillas in the Animals Species series. Look for modules about rhinos, mammals, giraffes, and penguins, coming soon. Click here to view a sample of the Birds course. The Cincinnati Zoo is now part of the Academy's collaborative learning environment. Welcome! Please join us for the Administrator's Users Group Webinar hosted by Academy partner, CypherWorx. The next webinar is Wednesday, November 18 at 11 a.m. PDT. Register here for the webinar. After registering, you will receive a confirmation email containing information about joining the webinar. Responsibility for the animals entrusted to our care (as well as those in the wild) presents innumerable challenges. Some of these are the everyday—but never unimportant—sort involving matters of care, housing, treatment, and welfare. There could also be a rare but serious animal-related incident. Others seem to arise outside of ourselves, and perhaps even our zoological organizations. These could include visitor behavior, publicly expressed or reported concerns (most notably, anything relating to animal welfare), regulatory considerations (possibly consisting of purported noncompliant items noted in an Animal Welfare Act inspection report), and perhaps even something like a complaint or harsh externally driven criticism (whether centered on tangible things or "philosophical" ones). Examining this broad range of potential challenges, representative of the universe of such situations, can make or break us—and our organizations—and even impact the animals in our care. As always, our attitude or consciousness is an indispensable element of our effectiveness. Our attitude and consciousness determine the quality of the transformative actions we can take to resolve challenges, grow from them, and use them as opportunities to better serve animals. Two categories of transformative action are: how we handle ourselves, and the manner in which we interact with and engage others. The former is our focus here, whatever the situation. Taking responsibility starts with us, because that is all we can control. True professionalism involves being accountable, which in turn unlocks our great potential to make things better. 2. Make those ideas even better (collaboratively whenever possible), and put the best ones into a plan. Take the ideas, apply the Beatles' advice in the song "Hey Jude" and "make it better," collaboratively when possible. The best ideas should be combined into a plan of action. 3. Take action (collaboratively whenever possible). Act on the idea or plan. Make it happen—collaboratively if possible. 4. Keep thoughts and actions focused solely on getting better and helping animals. Remind yourself of this constantly. Focus on getting better and serving animals. 5. Be grateful that you can change yourself for the better and, in doing so, help animals. We are all very fortunate to be able to use and improve ourselves in order to better serve and help animals. Be ever grateful, continuously improve, and make an even greater difference in serving animals and their interests. Last month, we discussed how a substandard environment, for whatever reason, places the fish under stress. This leads to an increase in cortisol, a natural hormone produced by the fish. This process, in turn, causes immunosuppression, which can suddenly cause typically innocuous bacteria that are normally present in the environment to cause disease and even death (see diagram) in the host animal. What are these environmental factors? By far the most important is water quality. In real estate, the saying is that there is nothing more important than "location, location, location." In fish keeping, it is "water quality, water quality, water quality." Maintain excellent water quality, and you will prevent up to 90 percent of fish health problems. The most important parameters within the fish's environment are the nitrogenous compounds (ammonia, nitrite, and nitrate). Ammonia is produced by fish as waste metabolite from the digestion of protein. Fish generally have high dietary protein requirements. Fish excrete ammonia, which in the biofilter (via nitrifying bacteria) is then converted to nitrite and finally nitrate. The nitrate comes late in this process. It is broken down to nitrogen gas by denitrifying bacteria. This whole process, called the nitrogen cycle, was covered in an Academy webinar I presented last year. To review all the information presented in this hour-long webinar, go to the Academy Course Catalog; under Browse by Category, scroll down to Pre-Recorded Webinars; then locate "The Nitrogen Cycle and Biofiltration." General hardness (primarily for freshwater fish). In future newsletters, I will examine many of these topics in detail. Several other environmental factors besides water quality are vital for keeping the stress level of the fish in our displays to an absolute minimum. These will be covered next month. Snieszko, S.F. 1974. The effects of environmental stress on outbreaks of infectious diseases of fishes. J Fish Biol. 6, 197-208. Helpful Hints section will return next month!